Iliotibial band syndrome is inflammation and pain on the the outer side of the knee. The iliotibial band is a layer of connective tissue. It begins at a muscle near the outside of the hip, travels down the outer side of the thigh, crosses the outside of the knee and attaches to the outer side of the upper tibia. Iliotibial band syndrome occurs when this band repeatedly rubs over the condyle of the femur, causing the band to become irritated. Many times this is due to jogging or running. The condition can result from tight muscles, connective tissue, discrepancy in leg length, and running on sloped surfaces. The iliotibial band (ITB) is a thick band of connective tissue that runs along the outside of the thigh. 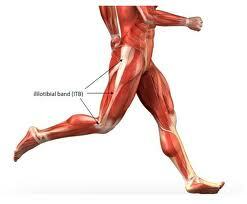 Iliotibial band syndrome is an overuse injury caused by repetitive friction of the ITB across the knee joint area. To lessen stomach upset, these medicines should be taken with food or an antacid. Ice for 10 to 15 minutes with hourly reapplication.